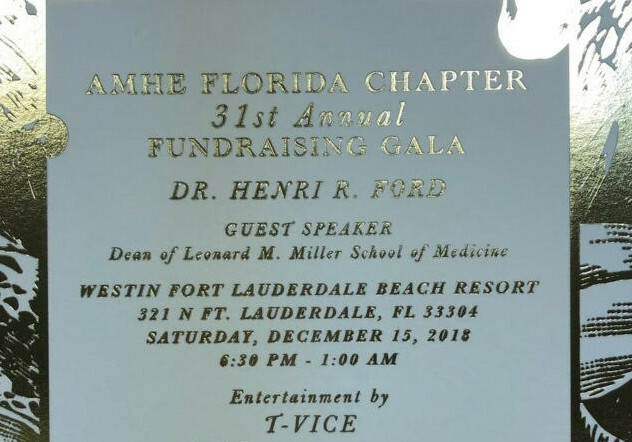 With more than 200 members, the AMHE: Flordia Chapter attempts to make an impact on our community at large. Our combined wealth of knowledge and expertise is spread among the following community projects. The Chapter hosts a weekly Health Education Radio Show every Sunday from 12:00 pm (noon) to 1:00 pm, on WSRF Radio 1580 AM in Miami, FL. The show provides culturally sensitive health information to our Creole-speaking audience in their native language. Regular hosts include Dr Smith Joseph, Dr Francelot Moise, Dr Serge Alexandre. Frequent topics include prevention and management of chronic conditions, such as Hypertension, Diabetes, Cardio-Vascular Diseases, Stroke, Sexually Transmitted Diseases, which are prevalent in our community. The Chapter organizes a number of Health Fairs throughout the year to provide health screening tests and immunizations for our community members who otherwise would not have access to those services. We also actively participate in Health Fairs set up by other Community-Based Organizations. Members are volunteering with the Medivan Project, which provides health care to the underserved elderly patient population in Broward County, FL. Members of the Chapter have also traveled to Haiti with Project Medishare, a Project that is dedicated to improving the health of the Haitian people by re-establishing the health infrastructure in several communities and facilities throughout Haiti. Members of the Chapter have participated in medical missions to the Bateys in the Dominican Republic where Haitian Migrants work under very difficult conditions, with limited or no access to healthcare. In addition, we have provided financial contribution and medical supplies to support those missions. In collaboration with the Central Executive Committee Members, the Chapter has provided financial, technical, and academic support to the State University Hospital in Haiti, the largest hospital in Haiti. We are also providing financial assistance to the “Maison des Etudiants” the “Students’ House”, where medical students, Interns and Residents at the State University Hospital, can obtain regular meals at a very low cost, that they would otherwise be unable to afford. In December 2007, the Association of Haitian Physicians Abroad awarded the first Annual Scholarships in the amount of $1000.00 each, to four high school students who have demonstrated academic excellence, dedication to community service, and a strong interest in a health care career. The Award Recipients were: Dolores Prudent, Magda Auguste, Eve Petit Frere, and Mike Jean Luis, all seniors from North Miami Senior High. The Florida Chapter of the Association of Haitian Physicians Abroad has partnered with the James Wilson Bridge Medical Society, an affiliate of the NMA, to contribute $50,000 to become a Founding Member of the New College of Medicine at FIU. Each organization will contribute $25,000: $5,000 per year over the next 5 years. Your continued support is essential to help us keep our pledge.